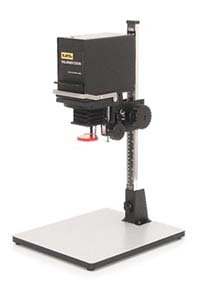 The LPL 3301D 35mm Condenser Enlarger is one of the most compact enlargers available. Perfect as a "starter" enlarger or for people with temporary darkroom setups where the enlarger must be removed and stored. The 3301D accepts a 35mm negative carrier (included) and optional 35mm mounted slide carrier. A lamphouse filter drawer is provided for variable contrast or color printing filters. In addition, the lamphouse can be easily removed, turning the chassis into a copy stand for use with a 35mm, digital, or small video camera. The enlarger is quick and easy to set up - just a couple of minutes and you're ready to go! The LPL 3301D Enlarger is supplied with a 35mm negative carrier, 75W enlarging lamp, red safety filter and instruction booklet. Enlarging lens not included.